Rodarte's debut at Paris Couture week, set in a Parisian garden, defined ethereal elegance with feminine silhouettes, lace, oral prints, and oversized metallic bow accessories. Morgan Taylor Lacquer lead artist, Tracylee perfectly translated the collection's aesthetic onto the nails. The romantic look was created with two coats of Morgan Taylor Lacquer's SUGAR FIX — a romantic light pink with an opalescent shimmer as the base. 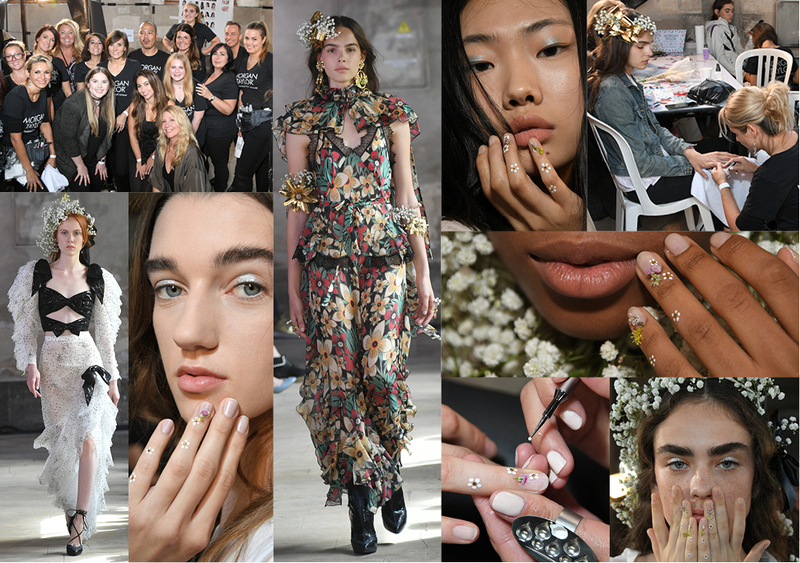 Next, a delicate chain of daisies was painted on the pinky and ring finger and nail using Morgan Taylor Lacquer's ALL WHITE NOW, a Nail Harmony Dotting Tool, & golden Swarovski crystals fastened in the center. The look blooms at the cuticle with a dainty bouquet of real flowers secured using lash glue.